Hoping a like minded green (veggie) chicken keeper may be reading this and be able to give a home to one or both of my cockerels. 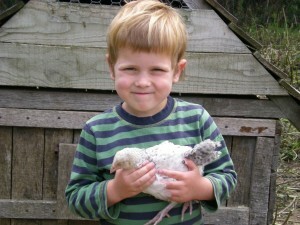 My four year old son Aleck is pictured above holding one of them when they were quite young. 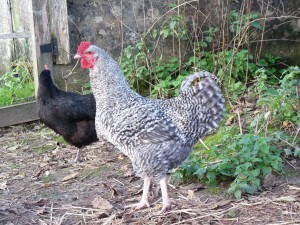 We have a stunning pure maran male and a maran x light sussex cockerel. A lifetime ambition was fulfilled last summer when I purchased what I thought were 5 lovely little lady chickens. Now 2 of the 5 have turned out to be male which is a bit of a problem for our family. Now the two cockerels have become unpredictable and I am unable to take my two young children into their run to feed and clean them etc. We wanted five docile female chickens for family pets, for the children to enjoy, interact with and develop a relationship with, collecting eggs and looking after them. We did this for a few months until the cockerels started shooting up, plumage sprouting and crowing, feet stamping and occasionally hurling themseves at me (luckily not the kids). The three hens are all lovely by the way, very very friendly and chatty. The lady we bought them from offered to take them back but explained they would just be killed to be eaten and as a vegetarian family – we cannot do that, even though whenever my Maran (above) stamps his feet at me – I try to explain to him that he should be grateful for mad women like me! He doesn’t ‘get it’ though does he!!! So I’m looking for someone who might have a few chooks and could take on one or two more – without the ultimate plan of killing them. Beyonce – the handsome Maran cockerel has been offered a home in Sidmouth as a stud, no less as he is needed to perform fatherly duties – right up his street, so we’re all very happy.